James Rodriguez wants to leave Real Madrid for Manchester United, if the latest reports are to be believed. James has been linked with a move away from the Spanish capital all season, after seemingly failing to impress manager Zinedine Zidane. The Colombian has repeatedly reassured the fans that he wants to stay at the Bernabeu, though with not much improvement in his situation, he might be forced to leave. This situation has alerted most Premier League clubs, including Manchester United and Chelsea. The 25-year old shares the same agent with United manager Jose Mourinho, Jorge Mendes, and this might become a huge factor if James decides to move. Liverpool and Arsenal are also looking at the possibility of signing the midfielder, however, and he could indeed be spoilt for choice during the transfer window. 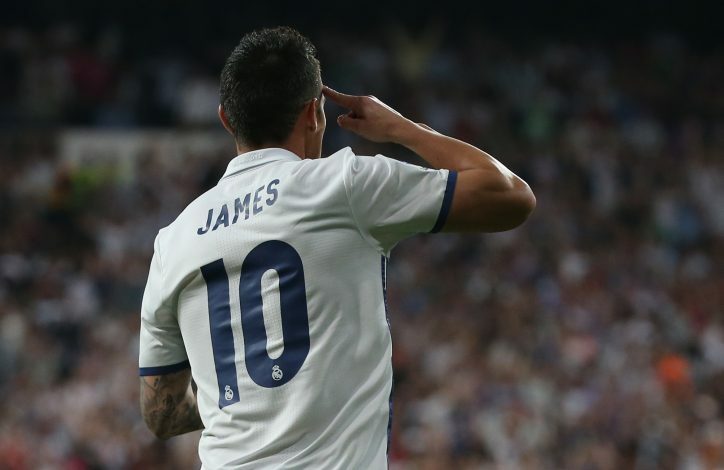 James is under contract at Real until 2020, meaning he will cost a significantly large amount. But as per Don Balon, that the Colombian skipper has already made his mind, and has decided to move to Old Trafford. Manchester United are rebuilding their squad under Mourinho, and they might just scrape through to the Champions League next season. With Michael Carrick probably leaving, and Zlatan Ibrahimovic and Wayne Rooney’s futures in doubt, James could easily fit into the Red Devils’ squad. James was a much hyped transfer to Real Madrid after his heroics at the 2014 World Cup. He impressed in his first season in the La Liga, scoring 17 goals in 46 appearances. He fell down the pecking order under Zidane’s stewardship though, being preferred after Isco, and sometimes Marco Asensio. He did display a glimpse of his talent, however, when he equalised for Real Madrid in last week’s El Clasico, which the Los Blancos went on to lose 3-2.